This is something that we hear an awful lot. Especially after the latest dog attack. Or when we walk by a barking, lunging dog. We see other dogs of the same breed being well behaved, why not this one? It must be the owners. The owners must have done something to make this dog so reactive and unpredictable! Dogs are not born as a clean slate. Otherwise we would not have breeds with such strong, instinctual, working traits. Border Collies are not trained from scratch how to herd sheep. Cocker Spaniels are not taught as puppies to be so obsessed with birds. Border Collies are already half way trained to herd sheep from birth. Farmers select dogs based on the instincts from only a few weeks old. Before any training begins. And those who are not selected, are usually placed in loving, active pet homes. However, when the instincts are still strong, they may go self employed and find something to nip and herd! It is the same for other working breed protection dogs, they are bred to be aware of strangers, bark to alert to intruders, or bite and hold onto people no matter what. The best workers are bred to the best workers to get stronger instincts and amazing workers. Of course it’s not just Border Collies who have strong working lines. Before choosing a breed, it’s always best to research the purpose of the breed beforehand. And don’t be surprised if your dog is barking because you got a watchdog breed! But what about bad owners? Unfortunately there is always going to be bad owners. Neglectful or abusive owners can lead to dangerous dogs. But at the same time, over protection and lack of rules or training can also lead to aggressive dogs. It is always the big, tough breeds that get a bad rap. We tend to forget about the snarling Toy Poodles, and defensive Chihuahua’s. So what’s the deal with that? Answer: Its not always the owners. Are you a ‘bad owner’? There are many different ways which you can be a bad owner. Some are painfully obvious, abusive and neglectful, and the worst kind of owner, the ones that knowingly treat the dogs badly. But what about the other kind? The ones that are doing their best? Or what they think is right? Ill informed – Owners that just don’t know that the way they treat their dog is wrong. Maybe they got bad advice from friends or neighbours. Or watched a terrible TV show…. I wouldn’t say that this is the owners fault. Rather that they have not found the right help yet. Training techniques – can training techniques really make a dog more aggressive? Yes. Any technique which creates fear, intimidation, or punishment, runs the risk of turning the dog to aggression. Too nice – Yes you can be too nice! In the same way little Timmy gets away with everything and is probably not very nice, a lack of rules and boundaries is needed to create a well mannered dog. Much like with children. Confusion – A confused dog is not a happy dog. If you create a rule then you must stick to it at all times, no exceptions. A good example of this is being allowed on the sofa, if the husband allows it, but the wife does not, it can create confusion and a possible aggressive response when being removed by the wife. Overprotective – Being over protective of a dog can stop the dog from learning to deal with a situation. It can also lead to the dog being rewarded for the wrong response, and in time creating a dog who uses aggression as a defence. Genetics and training are two components which can be controlled by humans. However, there is also another consideration: Learning history. The learning history of a dog is essential. Socialisation plays a huge role, well socialised dogs often turn out more well mannered and flexible. They are able to accept situations and environments more readily and react in the right way. They also bounce back faster from unpleasant experiences, rather than create a negative association. Dogs who are not well socialised are generally more cautious of new things, they are less flexible and more susceptible to one trial learning (where one bad experience creates a strong negative association with that situation, and sometimes other similar situations). 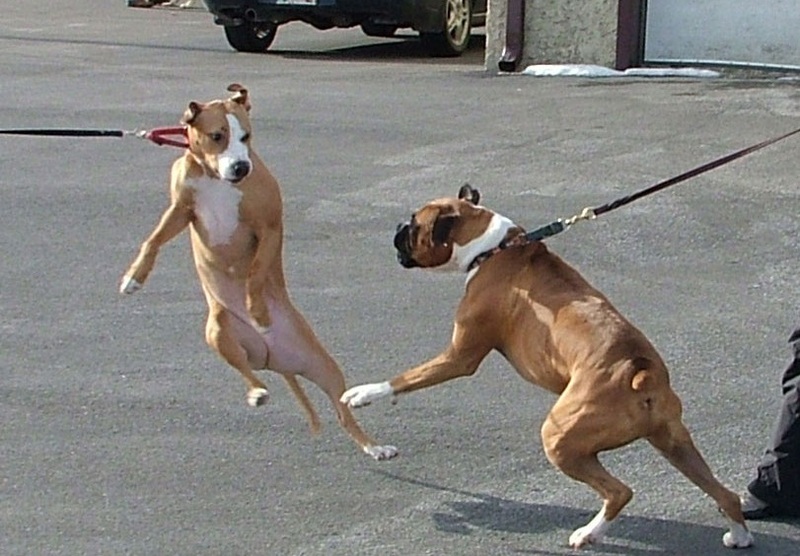 Dogs who have been attacked by other dogs, may also develop fear aggression in future. This is out of the owners hands and is completely down to the learning history of the dog. Just like human’s life experiences shape who we are as people. Rescue dogs are also more at risk of being reactive or ill behaved. As we cannot always know the full history of the dog in the re homing centre, its barely possible to say why. As you can see from above, aggression can be due to genetics AND/OR ill informed owners, as well as life experiences. Sometimes its the dogs nature, sometimes its how they were nurtured. Either way, aggression and bad dog behaviour is far too complex to blame one or the other completely. Which is why there is no definitive answer for the nature/nurture debate! I think its deeply unfair to always blame bad owners. Owners must take responsibility in preventing incidents from happening if you know that the dog could react. Most owners are not bad, just ill informed or struggling to deal with handling a reactive dog. Attacks on other dogs and people can 99% be completely avoided by learning about the dog’s temperament, reading the dogs body language, and taking steps to protect your dog and others from that situation arising. The only way we can create better owners is to spread the word of positive reinforcement training methods, and dispel dog training myths!